Valparaiso, IN, February 4, 2014 – Smalls Landscaping of Valparaiso, IN has been awarded “Best Of Houzz” by Houzz, the leading platform for home remodeling and design. The woman owned, award-winning landscape design/build firm was chosen by the more than 16 million monthly users that comprise the Houzz community. Business partners and sisters Nancy Marshall and Becky Whitacre, owners of Smalls Landscaping in Valparaiso, Indiana, were named the 2013 Landscaper of the Year by Total Landscape Care magazine. During a cruise to the Bahamas, Nov. 9-12, the two were recognized from among 12 finalists at the gala banquet. RACINE, Wis. (Dec. 3, 2012) – New Holland Construction and Total Landscape Care magazine today announced the winner of the 2013 Landscaper of the Year program – an annual program that recognizes the best and brightest from among thousands of professionals who work in the landscaping industry. 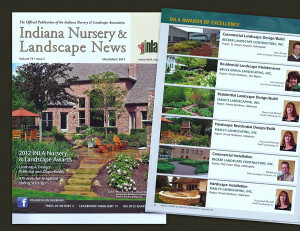 Nancy Marshall and Becky Whitacre, owners of Smalls Landscaping Inc. located in Valparaiso, Indiana, will be featured on the cover of the January 2013 edition of Total Landscape Care magazine. The 11 other Landscaper of the Year program finalists will be featured in the magazine throughout 2013. Sponsored by New Holland Construction and produced by Total Landscape Care, the Landscaper of the Year program honors landscapers who exemplify the highest standards of their profession, including business acumen, quality and aesthetic excellence of their project work, marketing and equipment management expertise, attention to safety and community involvement. The Armagasts wanted to create a private backyard entertainment area with a pool, an outdoor kitchen, a fire pit, multiple seating areas, a fishing pond and dramatic water features surrounded by lush, colorful landscape areas. In their search for a qualified company, the Armagasts said they received multiple referrals to Smalls Landscaping in Valparaiso, Ind. “Crafting this design required combining the needs and personal style of the client with functionality in an aesthetically pleasing space,” said Nancy Marshall, co-owner of the award-winning 10-year-old landscaping company, whose portfolio includes a landscaping project for Oprah Winfrey. This design/build project took place on a 10-acre residence that sits at the end of a long driveway, but is still visible from a busy street. The client wanted a pond they could enjoy from inside their house. They also wanted space to entertain, which included a firepit and places to walk through their new gardens. There was a 3-acre pond to the right of the house and an existing pool to consider. The client also wanted to re-use some of their existing plants.